A Year in Shulinab: My Project! On Wednesday this week (the 1st of May) I recieved the details of my project! I've already told a few people a little bit, but here's the information. My partner (who I meet on training in July) and I will be in a village called Shulinab, which is situated in the Upper Takutu - Upper Esequibo region of Guyana, otherwise known as Region 9. I hope that's helpful, as I'm sure everyone has a thorough knowledge of the geography of Guyana...... 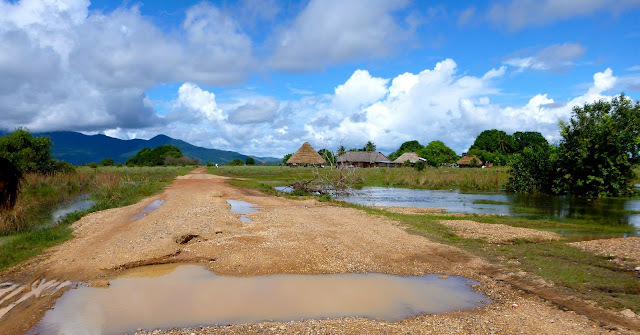 The village is just by the Kanuku mountains, and is the only Macushi village in the south Rupununi. I will be teaching in the local primary school, which is as much detail as I have about that right now. My house, in typical Amerindian style, will be built from mud-bricks and have a roof made from leaves. Apparently the house is 'clean, airy and comfortable' - let's hope so! There isn't running water but I will have electricity (although limited, and what there is comes from a solar panel) and definitely no internet, so expect intermittent updates on here. In the compound there is a long-drop toilet and wash hut, as well as a benab (look it up) where I can hang my hammock. I hope that 'sets the scene' as to where I'll be nicely - better than university halls anyway.